How do you post pics to our Facebook Page? On the top of our page, you can post a STATUS UPDATE which appears to be like this. This box allows you to write a comment and/or click the photo to attach a photo with your comment. Once you click Post, it appears to slide under the home page but when you refresh your screen, it automatically files itself in the Recent Posts by Others on The Crochet Crowd. Recent Posts by Others is in chronological order. If there is a photo attached in this list, there will be a paperclip beside the comment. If you click SEE ALL, it will show you everything that everyone else has posted. Does your photo not load? If your photo isn’t loading, it’s because your own personal Facebook settings has your photographs assigned to be private and/or friends only. When your photos are assigned this in your Facebook privacy settings, it will not allow you to post you photos to PUBLIC pages such as The Crochet Crowd. For help on this issue, see Facebook Privacy Help Settings. Once your photos are allowed to be viewed by the public, you will be able to upload photos. Daily, we select photos from Recent Posts by Others to feature. When we do a feature, it puts a duplicate post on our page carrying over your information and photo. Comments, likes and posts are added to your original post. If you have ‘uploaders remorse’ where you regret the photo, you can simply remove your photo and it will remove your feature immediately. We do not upload photos for our fans or make any side deals to automatically feature photos. We love how this is random and unexpected. It keeps it being a fair chance for anyone to be featured. 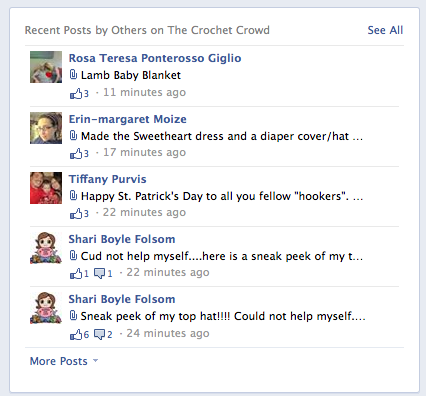 The Crochet Crowd Facebook is for all Crochet Crowd Members. We have established community guidelines for what can and cannot be posted. Due to the size of our community, we have the best interests of the community as our base to protect. If you have found The Crochet Crowd and see us as a sitting target to sell or using luring tactics… you won’t be a member for long as we have a zero policy form these sorts of activities on Facebook. The majority of our community expects this of us. The Crochet Crowd never goes onto other Facebook Pages to solicit likes or ask to gain subscribers… we expect the same courtesy in return. This entry was posted in Social Media Tips and tagged crochet crowd, Etiquette, Facebook, Media, Mikey, social, Tips. Bookmark the permalink. Kathy, Mikey, or Dan, Thanks for posting this. I was having issues just about 10 min. ago. This was a big help…I swore I knew how to upload, but it seems there are different ways to every site. Mikey, I am trying to sell some of my projects. But I do not post them on your facebook page, only on my page. I don’t think they show on your page. I don’t want to be booted from your site. I’ve learned so much from here & the creativity astounds me.